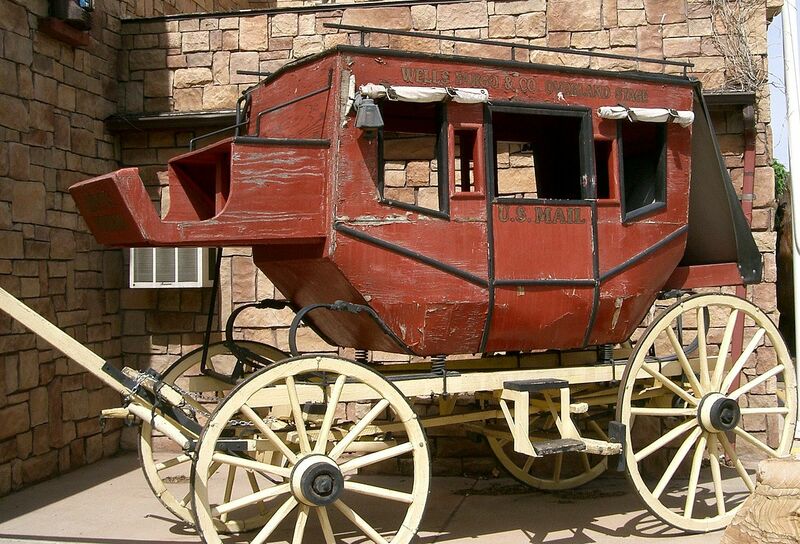 The Wells Fargo stagecoach skidded to a stop in front of the armed man, clad in a long, soiled duster. His face and head were covered with an old flour sack with two holes cut for him to see through. His double-barreled shotgun, held at a jaunty angle, suggested he would put it to use in an instant if the driver didn’t stop. “Please, throw down the box.” The bandit called out to the driver, then glancing around at the rocks, he raised his voice to be heard by everyone. “If he dares shoot, give him a volley, boys.” The stagecoach driver’s heart thumped as he noted at least six guns pointed at him from the surrounding rocks. The driver grabbed the strongbox from underneath his seat and tossed it down to the outlaw. He called back to his passengers to stay calm and not panic. One of the women became so distraught she threw her purse out to the outlaw. The hooded bandit crossed to the bag, picked it up and handed it back in to the woman. 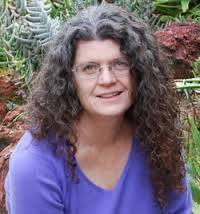 He said, “Madam, I do not wish your money.” Thus, the robber earned the name, Black Bart, the gentleman outlaw. 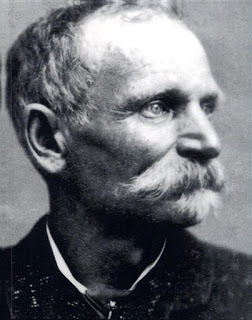 Charles Boles, (Black Bart, aka Charles Bolton) resided in San Francisco in the 1870’s. He was an older gentleman in his 50’s with white hair, a nice grandfatherly type. He preferred fancier clothes, walked about with a cane, and enjoyed strolling about his neighborhood. No one who knew him would have guessed he also had lived a life as a bandit. Not this refined gentleman. Black Bart was different than many outlaws. He worked alone and didn’t rob every stage he heard about. He invested his money in small businesses, and only robbed Wells Fargo stages when he needed more funds. He loved stay in nice hotels and eat at fine restaurants. Bart treated women with great respect, as he did all the victims on the stages he robbed. On more than one occasion he refused to take the valuables and money from a flustered lady passenger. He always tried to assure them he meant no harm to them, but only wanted what Wells Fargo had to offer. he never dressed in black and didn’t resemble the description of the dime store novel’s outlaw. The one thing all the stage drivers remembered about Bart was his clear, blue eyes, shining out from the holes in the flour sack. They couldn’t forget the color of those eyes. Black Bart began to write poems, which he left at the site of his robberies. He signed them P o 8, which stumped the lawmen who were trying to catch him. He always disappeared without a trace. Even the poems gave no clue as to who Bart might be or where to find him. Black Bart’s life of crime came to an end after a robbery he committed in November 1883. The sheriff who investigated the robbery examined the ground closely and found a handkerchief which contained a laundry mark. The handkerchief was taken to San Francisco and a search began for the laundry that used this mark. They found the correct laundry and as they were questioning the owner, Charles Boles, the owner of the handkerchief came through the doors. Boles spent over six years in prison, but the story has it that after he was released, he disappeared. Another robbery occurred and the bandit left a poem. Upon examination it was agreed this poem was a copycat. Rumor has it that Bart was so successful in his efforts against Wells Fargo that the company paid him a yearly stipend to cease from robbing their stagecoaches, and he did. Have you ever heard about Black Bart, the gentleman bandit? Can you guess why he signed his notes P o 8? Thank you for stopping by. P for poet? 8 as a "brand" sign making use of two Bs? What an interesting thought, Debra. I hadn't considered the 8 as a sign using the two B's. Thank you for commenting. P, o, 'et' in the 8. Poet. Fun post, Nancy.